Michael L. Trantham was working as a manager at a U-Totem convenience store in Dallas, TX in the spring of 1972 at the age of 17 making $1.65 per hour and was living with his parents. Every day, a young man named John would come in to buy lots of cold drinks. When John would open his wallet to pay, Mike noticed that he had lots of cash in his wallet. Mike asked John what he did to get all that money. John replied, “Mowing yards”. 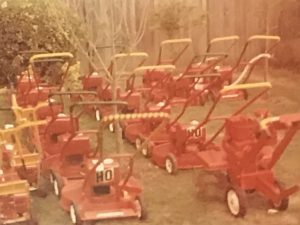 Now, Mike had never thought of it as a business because he used to make spare money when he was very young mowing his neighbors’ yards to earn money for the things he wanted to buy for himself. Now, he saw lawn care as a business opportunity. It must have been in Mike’s blood because he loved growing things. His two grandfathers had very large vegetable gardens and taught him about plants at a very young age. Also, his dad started teaching Mike mechanical skills at a very young age. Mike went home and had some business cards made up that said “You furnish the mower, I will do the rest” with a smiley face. How 70’s! “Keeping customers happy” was his motto. He threw his Dad’s edger in the back of his 1962 Buick special, and started knocking on doors in neighborhoods. By the end of his first day, he had managed to sign up 10 customers. Because each of those customers had a different brand of lawn mower, he learned quickly how to run and repair multiple brands of mowers. He bought a 1957 Chevrolet truck from a friend down the street for $125, painted it bright yellow and put signs on it and added a trailer. Then he quit his U-Totem job. That summer he managed to get 35 yards per week doing all the work himself. Remember at that time leaf blowers and weedeaters were still in their infancy. Brooms, rakes and hand clippers were the rule of the day. Being innovative, Mike often used a few household vacuum cleaners on extension cords to clean up clippings on cement. Doing all the work himself with a growing business, Mike was a very tired young man at the end of each day. After high school graduation in 1973 and turning down two track scholarships because of a girl, Mike stayed in Dallas to help work himself through college. 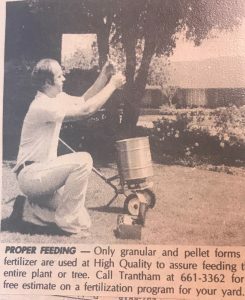 In the summer of 1973 Mike passed out 10,000 circulars to grow his business, while his good, supportive parents started answering the flood of phone calls. 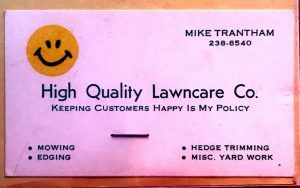 High Quality Lawn Care was born and took off. To help out with all the new customers and to help serve the community, Mike started hiring participants in the Palmer Drug Abuse Program. That was an extraordinary experience for Mike, to balance serving his customers with good service while helping others recover and rebuild their lives. Mike crossed paths with some of them decades later, and they were clean, healthy and working as professionals. They thanked Mike for his faith in them. That meant a lot to Mike. Soon, Mike needed more people to contribute to his growing enterprise. In the summer of 1974, he hired a family of brothers that he picked up every morning where they lived in Addison. Mike now was working along with his 3 employees in one truck and quickly learned the value that good people brought to the success of his business. That fall he started classes at Richland Junior College to get some basic courses out of the way. He purchased a second truck, a 1959 Chevy with a trailer, so that his guys could work while he was at school. By the time he was out of college for the summer of 1975, the business had grown to 125 yards and 3 apartment complexes. To take care of his customers when he went away to North Texas University that fall to study marketing, he had a couple of his friends watch over his business for a percentage of the profits. In the summer of 1976, Mike and his team started learning how to work on sprinkler systems. He also learned and started offering services to spray for outdoor insects to better serve his customers. Not long afterwards he expanded to the lawn fertilizing and tree business. To house his growing business, he began exploring places to rent in North Dallas. One day he drove down McCallum road in the old town of Renner (which is now part of Dallas) and saw an historic Church on the corner of Frank Jackson Dr. and McCallum. A wall paper outlet being operated inside the church. Although there was no sign for rent, Mike asked the owner if he could rent the land behind the church and put up a little storage building for his equipment. The man said he could, and would also rent the back room of the church which had a separate door to the outside. This could serve an office for Mike. $250 per month started the next chapter of High Quality Landscape Services. Mike started selling trees in the back lot and trimming trees for people. So that the lot looked busy for potential new customers, Mike had his parents come out on weekends and walk around the place acting like customers. At that point in history, that part of old Renner was out in the middle of nowhere. In the old parsonage across the street, some of the old timers (people who have streets named after them) would play cards in the back and Mike would visit with them frequently. Mike stayed at the old church until the owner donated it to the historical park in Farmers Branch. You can visit it there. In 1983 he hired Erasto Colmenero, and personally trained him. Erasto was a tireless member of the team, and could work as fast as 2 men. Today, more than 35 years later, Erasto is still a valued member of the High Quality Landscape Services family. With the donation of the church, Mike needed to move his operations to a new location. A few blocks away Mike started renting half a house and a barn from a friend that ran a landscape company. He kept the business there for a few years until, in 1988, he noticed an old Renner historical house come up for rent about 3 lots down. The house was already zoned business services. He asked the couple that owned that house if they would consider owner financing, and they miraculously said yes! That was Mike’s first big break in owning his own business property. He soon bought the vacant lot next door and his business really started growing as a full service landscape company. As he continued growing into the early 90’s, Mike always practiced his motto “Integrity, Knowledge and Hard Work”. During that period, Mike was known for taking his pet blue and gold Macaw parrot, Ziggy, with him to estimate landscaping jobs. Ziggy would ride on Mike’s shoulder, and Mike potty-trained him to keep his shirts clean. It was during the ‘90s that Mike started using the Pink Flamingo with a palm tree as a logo to attract attention. People started seeing the new logo and thought they were specialists in tropical landscapes. Mike had to quickly learn about caring for tropical landscapes and it naturally followed that Mike would start wearing tropical shirts. Today, Mike is well known in the industry and by customers for his tropical shirts. With the business flourishing, Mike needed someone full time running the office, so his sales manager hired Nancy in 1993. Mike and Nancy fell in love and got married. Together, they worked night and day to build the business for the last 25 years. Renee DuPont came on board in 1998 to become office manager because Nancy needed to help Mike in the field more. Mike, Nancy, Erasto and Renee worked tirelessly to build High Quality Landscape Services into a leading Dallas landscape service provider with an excellent reputation amongst its customers. The old historical house that they were using as office space, resulting in the decision to tear down the old house and build a new office/warehouse on the property. In February of 2002, they moved into the new building, where the business still resides today. With the business growing and developing a reputation in the region, in 2017 Mike and Nancy decided it was time to retire. After 45 years in the industry, building High Quality Landscape Services into one of the region’s leading full-service landscaping contractors, Mike turned the reigns of the business over to its current management. Today, we honor and value Mike’s original motto of “Integrity, Knowledge and hard Work.” We are proud to be a part of and are continuing the legacy that Mike started back in 1973.